No matter how much or how little work is being done, a home remodeling project is a big deal. Proper organization is the key to avoiding undue anxiety as the work is completed. Besides planning the details of the remodel itself, thought needs to be given to the needs of the workers who will be spending long days on the property. For example, many homeowners find it beneficial to invest in renting a portable toilet in Seattle during the construction process. With any project, the first steps include deciding exactly what needs to be done and setting a budget. Once the details have been determined, such as colors and designs; measurements; the contractors who will be involved; the length of time the project will take to complete and the approximate cost, one of the first steps to take is to compile all the information. This includes everything from paint chips, fabric and carpet samples and “before” photos to contracts and receipts. Depending on the scope of the project, the inside of the home may be in a state of upheaval during the remodeling project, so it is important to have handy access to these items. They can be kept in a zippered binder, an accordion file, or a clearly marked plastic tote. Declutter the area as much as possible before the work begins. It can be frustrating to have so many things out of place during the project, and it is helpful to prepare ahead of time. Pack away things that will not be needed during that period and get them out of the way, even if that means renting a storage unit. Make sure any boxes or containers used for this purpose are organized and labeled. This might even be a good time to get rid of things that are never used. 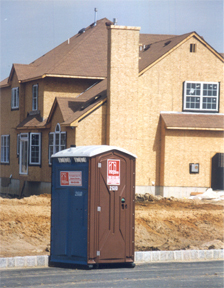 It may be a good idea to arrange for a portable potty at the onset of the project, as the workers are going to need to use the restroom somewhere. Many homeowners prefer that their private house bathrooms not be made available for strangers to use, for both privacy and security reasons and cleanliness. The Internet should provide information on companies who offer this service, or a company name and phone number may be obtained off a portable facility at a local construction site. Fees are usually reasonable, and weekly cleaning is included in the price. The toilet should be placed far enough away from the home that odor will not become an issue. It is also important to be considerate of any neighboring dwellings, and to put the facility a good distance from them. It should be out of neighbors’ line of sight if possible. Another thing to be aware of is that occasionally joggers, delivery drivers or other random people may see a portable toilet and stop and use it. Sometimes vandalism may also be an issue. To prevent either of these, it is advisable to put a lock on the door after the workers leave for the day, and keep it locked until the next morning. Remodeling is a lot of work, but can be made easier with proper planning. Make lists, and keep things organized. Check out our porta potty services and try to make life as simple as possible during the project.